When it matters most, you’ll find compassion, understanding, expertise and a national reputation as outstanding plaintiff’s attorneys at Dollar, Burns & Becker, L.C. We aggressively pursue maximum compensation for injuries and hold at-fault defendants fully accountable. We've successfully prosecuted thousands of these cases all over the country for victims of negligence nationwide. If you, a family member or a friend has suffered catastrophic injuries as the result of truck crashes, nursing home abuse, bad faith or gross negligence, or if needless deaths have occurred, you’ll find vigorous representation here. We hold at-fault individuals and companies accountable and have successfully required local, regional and national firms to make significant safety changes to policies and procedures. As victims’ rights advocates, we also fight for legislative reform. At Dollar, Burns & Becker LC of Kansas City, our goal is to bring positive change to the trucking industry by winning record verdicts and settlements against the companies that put untrained and exhausted drivers, and poorly maintained trucks, on the same highways as our families and kids. The million-dollar awards we obtain for injured clients and surviving family members are important. Just as important is sending the message to fleet owners that negligence and carelessness will be held to account. If you have been seriously injured or lost a loved one to a trucking accident of any kind involving an 18-wheeler or a package delivery van, call the lawyers at Dollar, Burns & Becker LC of Kansas City. We are there when it matters most. The experienced trial attorneys at Dollar, Burns & Becker have helped thousands of families all over the country recover emotionally and financially when loved ones are killed or seriously injured through negligence or abuse. 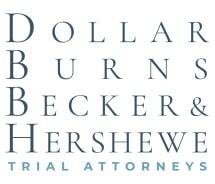 Dollar, Burns & Becker, L.C., has represented clients and families affected by catastrophic injuries, even death. We have the expertise you need to hold negligent persons or companies accountable. Our attorneys have made it their life mission to help people hold at-fault parties responsible and bring about change. We welcome the opportunity to work on catastrophic injury cases referred from other attorneys or law firms around the country. No matter where a truck crash happened or where a victim may live, Dollar, Burns & Becker will be there when it matters most. There are no reasons truck crashes should occur, and when they do, we serve as the victim's voice and fight for change.